Big Data is a hot topic in business. As the name of a phenomenonthat entails an exponential increase in the amount of datathat could be generated and processed, Big Data is characterizedby three V’s: volume, velocity and variety. First, data is becomingavailable in volumes that are many times larger than before, drivenby interconnected phenomena such as the Internet of Things.Second, data is no longer processed in batches, but transmittedand analyzed on a continuous base, in real time. Third, Big Datais made up out of unstructured data from a variety of sources,such as social media or video, which must be integrated withstructured data for decision making. The potential offered by BigData extends to a wide variety of industries and applications. Forretailers especially, the phenomenon offers substantial opportunitiesto better serve customers and manage costs. We believe the exploitation of Big Data in retail can bringabout highly positive developments for the industry, theirsuppliers and their customers. Opportunities to boost sales andbetter manage costs will be abound and should be exploited byretailers. Doing so will allow them to improve their bottom-linewhile warding off the threat of super crunchers. 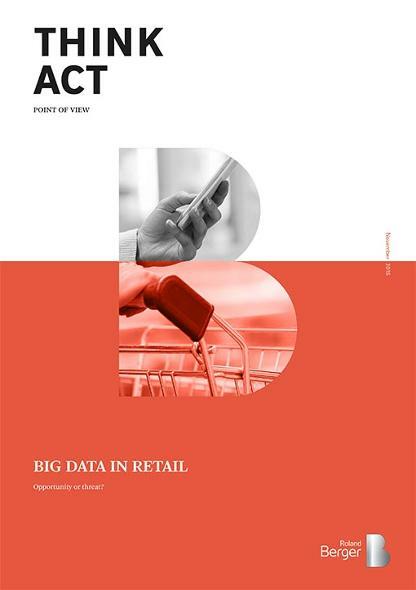 Big Data has the potential to boost retailers' performance.